Arcadia Power Review: Can You Get Clean Energy for Cheaper Than What You’re Paying Today? Do you know how much of your energy is coming from “dirty” sources? Do you know how much is coming from renewable sources, also known as “clean” energy? If you don’t, you’re not alone. Many people aren’t aware of how electricity works and where it comes from. Arcadia Power Review: How Does it Work? Arcadia Power then sells this clean energy to you. These are just a few examples, but the point is that once that energy is harvested, it all looks the same flowing into the national energy grid. That means that “dirty” power from coal mines would function the same as “clean” power from solar energy. Once the power gets to the outlet in your house, it’s all the same. The only difference is the source. Currently, only about 17.1% of the electricity used in the United States comes from renewable sources according to the U.S. Energy Information Association. Arcadia Power is trying to increase that number by giving consumers the tools needed to make an easy decision to switch to renewable energy for free. This Arcadia Power review is going to delve into how Arcadia Power works, pros, cons and then final thoughts you can use to decide to make the switch or not. So what exactly does Arcadia Power do? Does it redirect renewable power directly to your door? The short answer is no. Here’s what Arcadia Power actually does. Instead, Arcadia Power buys energy from renewable sources like solar, wind, hydroelectric and geothermal energy farms. When the company buys the renewable-sourced energy, it collects Renewable Energy Credits (RECs). These credits certify that that energy was produced in environment-friendly ways. Arcadia Power can then use these RECs to provide clean energy to its customers. So when you sign up with Arcadia Power, you are essentially letting them take over your energy needs and decide for you the kind of energy that powers your home. Arcadia Power will also alert you to money-saving energy opportunities. 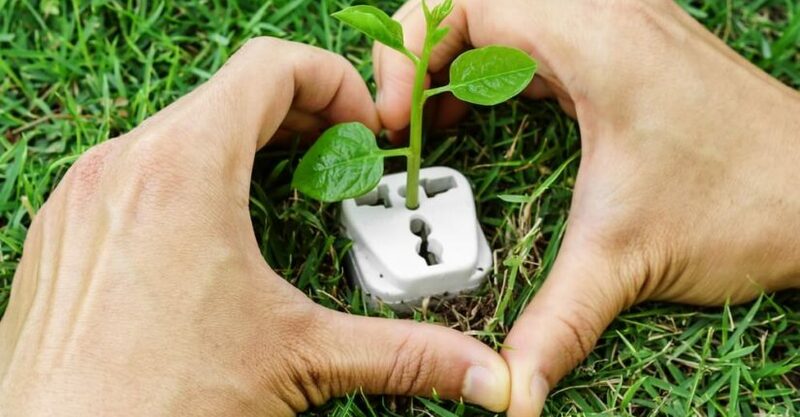 By buying power from a green energy source, you can make sure that you’re helping the environment and potentially saving money with the help of Arcadia Power. Switch to clean energy and start saving money. Click here to start today! The first step to signing up for Arcadia Power is by creating an account at this link. The next step is to link your current electric utility account with Arcadia Power. You are not “switching” providers. Instead, it’s like adding a middle man who knows a lot about local green energy resources near you. After this step is done, congratulations, you are now an Arcadia Power customer and will be receiving either 50% or 100% of your energy from green power sources. Now, when you receive your electric bill, Arcadia Power will step in, charging you and then paying your electric company on your behalf, taking into account the green energy you opted into. This process is automated after setup, with Arcadia Power helping to enable people to support renewable energy sources without too much extra hassle on their end. Arcadia Power makes money by offering one service plan for free and then offering more comprehensive plans for a price. For example, if you choose the free plan then you get 50 percent of your energy sources from renewable locations. However, if you choose to go with the premium plan, which is not free, then you get 100 percent of your energy sources from renewable locations. The premium plan’s cost is part of how Arcadia Power makes money. The company also makes money in a few other ways as well. As mentioned above, Arcadia Power deals with Renewable Energy Credits (RECs), which the company earns a commission on. They also earn money by connecting you to local Arcadia power community solar reviews and solar power options. Additionally, they make money on product sales when they partner with brands, such as Nest Thermostat, for example. Save money with clean energy. Click here to start tracking both your impact and savings! Arcadia Power is an incredible opportunity for everyday people to positively impact the environment — and perhaps their bank account — without extra cost or hassle. Not only is Arcadia Power in the environment-saving business, but they are also in the saving-you-money business as well. Now, we wouldn’t be reviewing this if it wasn’t about money in some way. Arcadia Power can potentially save you money just by switching up what kind of power you’re using. With their free plan, you get access to Arcadia Power’s dashboard as well as additional services. Pro Tip: One such service is their price alert feature, which is available in states with deregulated energy laws. The price alert feature checks your local energy market and finds the lowest rates possible for you. You can then switch to you lower energy rate plan when available. Arcadia Power’s goal is to save you money while helping to increase renewable energy use. We all know that renewable energy — such as wind, solar, geothermal and hydroelectric power — is better for the environment. Nonrenewable energy can damage the environment and cannot be easily put back once taken from the earth (e.g. coal). That’s where Arcadia Power comes in. It’s an easy way for people to make renewable energy a part of their everyday life without going to too much effort or needing any special knowledge. By signing up with Arcadia Power, you’ll be helping the environment by using renewable energy sources. Do you want to make a difference but don’t want to or can’t pay for expensive changes in lifestyle? The free plan doesn’t cost you a thing and allows for 50 percent of your energy sources to switch to renewable energy. That means you can have the freedom of better energy for the environment without paying more per kWh. Arcadia Power gives you a utility dashboard where you can see your local energy options. That’s amazing because most local utility companies are monopolies who won’t offer a similar service. These software tools allow you to take charge of how you spend and save money on energy bills. You’ll be informed and in control. That’s right. There are no length contracts to sign and no binding agreements. There is no long-term membership that will lock you in. It’s completely free to cancel any time you’d like to if you change your mind about Arcadia Power’s membership plan. Improve your home’s efficiency and save money in the process. Sign up with Arcadia Power today. Of course, this Arcadia Power review would be remiss not to also mention the cons associated with the company and provided service. It’s important to have all aspects of a decision so you can make the best-informed decision for your own lifestyle. So, here are some reasons why you may not want to sign up for Arcadia Power just yet. The cost of Arcadia Power plans depends on both your location and your needs. For example, the 50 percent renewable energy plan is actually free. However, if you really want to do the most for the environment then you might decide to go with the 100 percent renewable energy premium plan. With the premium plan, you will pay 1.5 cents more per kWh. This means that your energy will be slightly more expensive for the 100 percent renewable energy plan. It is a matter of deciding what is more important to you. For many, paying the little bit more will be worth the commitment to using only renewable energy sources. The type of plans available to consumers are based on where they live. This means that not everyone will be able to qualify for the energy plan they may want. This is due to local and state laws regarding deregulation of energy and also type of renewable energy available locally. So, while it can’t be helped by Arcadia Power, it may also not be ideal for consumers wishing for one plan but being unable to access it due to location. As is common nowadays with many businesses, auto-pay is Arcadia Power’s preferred and only payment method. This might not be an ideal feature for two reasons. First, some people just don’t like automatic recurring payment plans in general. In that case, this won’t be an ideal situation for them. Second, if the account you’re using is drained every month then you might not have enough to pay the recurring bill. Now, you can delay auto payments for up to three days, but even so, make sure that the payment method is something you’re willing to take on. Just like any company trying to exchange their goods or service for money, Arcadia Power is going to try and upsell you on their premium plan. Why? It’s simple: its other plan is free while the premium plan makes them money. Of course, you do not have to sign up for the premium plan. Just keep it in mind that they are going to try and sell it to you. So, is Arcadia Power a scam or is it legit? As you can probably tell from this article, Arcadia Power is indeed a legitimate way to become more well-informed about your energy choices and switch to 50 percent green energy use for free. Of course, as with any company service or product, there are pros and cons associated. If your focus is on the environment, then you can go with a 100 percent premium plan, which has a slight cost associated with it. Meanwhile, if your focus is on helping the environment but not at the expense of your own finances, you can go with the free plan, which provides 50 percent green energy. Pro Tip: Other things to think about include availability in your location and whether or not recurring auto-pay is fine or not. Balanced against that is that you can cancel anytime and that the 50 percent option is completely free. There’s even a handy dashboard for you to navigate your energy options. All in all, Arcadia Power company is an excellent resource to use for free in order to help the environment. If you’re even wondering about trying it, then why not go for it? If it doesn’t work out, then there’s not really any cost to you. Arcadia Power is committed to increasing renewable energy use across the U.S. and you can help! Have a more positive impact on the environment today with Arcadia Power. Want to save money while helping the environment? Click here to sign up for Arcadia Power!